In the range of solar system worlds, Earth is the only known home to life. It's also the only one with liquid water flowing across its surface. Those are two reasons why astronomers and planetary scientists seek to understand more about its evolution and how it came to be such a haven. Our home planet is also the only world with a name not derived from Greek/Roman mythology. To the Romans, the goddess of Earth was Tellus, meaning "the fertile soil," while the Greek goddess of our planet was Gaia or Mother Earth. 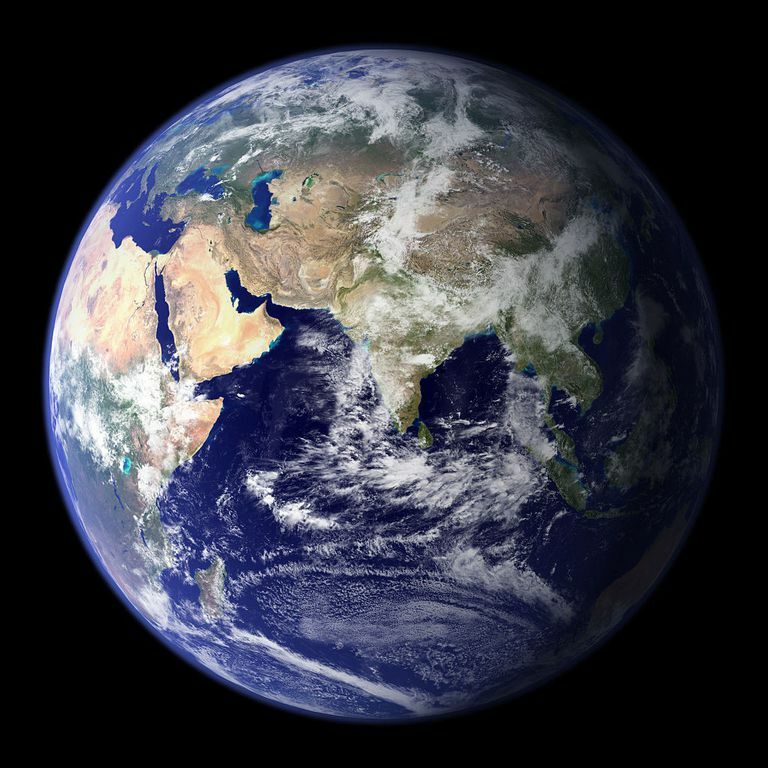 The name we use today, Earth, comes from Old English and German roots. It's not surprising that people thought Earth was the center of the universe only a few hundred years ago. This is because it "looks" like the Sun is moving around the planet each day. In reality, Earth is turning like a merry-go-round and we see the Sun appear to move. Belief in an Earth-centered universe was a very strong one until the 1500s. That's when Polish astronomer Nicolaus Copernicus wrote and published his grand work On the Revolutions of the Celestial Spheres. In it pointed out how and why our planet orbits the Sun. Eventually, astronomers came to accept the idea and that is how we understand the position of Earth today. Earth is the third planet out from the Sun, located at just over 149 million kilometers away. At that distance, it takes slightly over 365 days to make one trip around the Sun. That period is called a year. Like most other planets, Earth experiences four seasons each year. The reasons for the seasons are simple: Earth is tilted 23.5 degrees on its axis. As the planet orbits the Sun, different hemispheres get more or fewer amounts of sunlight depending on whether they are tilting toward or away from the Sun. Compared to other worlds in the solar system, Earth is incredibly life-friendly. That's due to the combination of a warm atmosphere and a large supply of water. The atmospheric gas mixture we live in is 77 percent nitrogen, 21 percent oxygen, with traces of other gases and water vapor The affects Earth's long-term climate and short-term local weather. It's also a very effective shield against most of the harmful radiation that comes from the Sun and space and swarms of meteors our planet encounters. In addition to the atmosphere, Earth's has abundant supplies of water. These are mostly in the oceans, rivers, and lakes, but the atmosphere is water-rich, too. Earth is about 75 percent covered with water, which leads some scientists to call it a "water world." Like other planets, such as Mars and Uranus, Earth has seasons. They are marked by the change of weather, related to how much sunlight each hemisphere gets throughout the year. The seasons are marked (or delineated) by the equinoxes and solstices, which are points that mark the highest, lowest, and medium positions of the Sun in Earth's sky. Earth's abundant water supplies and temperate atmosphere provide a very welcome habitat for life on Earth. The first life forms showed up more than 3.8 billion years ago. They were tiny microbial beings. Evolution spurred more and more complex life forms. Nearly 9 billion species of plants, animals, and insects are known to inhabit the planet. There are likely many more that have yet to be discovered and cataloged. It's clear from even a quick glance at the planet that Earth is a water world with a thick breathable atmosphere. The clouds tell us that there's water in the atmosphere as well, and give hints about daily and seasonal climate changes. Since the dawn of the space age, scientists have studied our planet as they would any other planet. Orbiting satellites give real-time data about the atmosphere, surface, and even changes in the magnetic field during solar storms. Earth is a rocky world with a solid crust and a hot molten mantle. Deep inside, it has a semi-molten molten nickel-iron core. Motions in that core, coupled with the planet's spin on its axis, create Earth's magnetic field. Earth's Moon (which has many different cultural names, often referrerd to as "luna") has been around for more than four billion years. It is a dry, cratered world without any atmosphere. It has a surface that is pockmarked with craters made by incoming asteroids and comets. In some places, particularly at the poles, the comets left behind water ice deposits. Huge lava plains, called "maria," lie between the craters and formed when impactors punched through the surface in the distant past. That allowed molten material to spread out across the moonscape. The Moon is very close to us, at a distance of 384,000 km. It always shows the same side to us as it moves through its 28-day orbit. Throughout each month, we see different phases of the Moon, from crescent to quarter Moon to Full and then back to crescent.